Some of my favorite movies are zombie movies. At this point, however, even a die-hard fan like me has to admit that this particular horror sub genre is starting to smell about as fresh as the walking corpses that populate it. All you have to do is browse through the horror category on Netflix (or at your local video store if you still have one) and you'll find a ridiculous number of films starring the flesh-eating undead, almost all of them unwatchable by any but the least discriminating gorehounds. In this context Howard and Jonathan Ford's THE DEAD, while no modern classic on a par with 28 DAYS LATER or SHAUN OF THE DEAD, proves nonetheless a refreshingly well made and reasonably entertaining offering. Well, in parts, at least. The Fords are definitely not out to reinvent the wheel here. They follow all of the rules and hit many of the same notes as the George Romero zombie films that started this whole zombie thing off in 1968 with NIGHT OF THE LIVING DEAD. If you wanted to tell yourself that this film was taking place in the same fictional universe as Romero's films, only set in Africa instead of Pittsburgh, there's nothing here to contradict that. What little originality the film does have comes from its setting and the “mismatched buddy” road movie structure of the plot. Murphy (Rob Freeman), an American engineer with a military background, is desperately trying to get off the continent and back home to his wife and child. He teams up with Daniel (Prince David Oseia), an African soldier looking for his son . 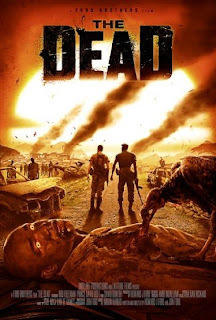 While trying to reach their destination, the two must work together to overcome various obstacles in their way, most of them involving reanimated corpses that want to eat them. That's pretty much it. There's a half-hearted attempt to give the film a little bit of subtext about how the white man interferes in Africa in an early conversation between Murphy and Daniel, but it doesn't get followed up on. The major theme the directors seem to be trying to express is one of holding on to hope, but it doesn't really come through that way in the end. As just a straight forward zombie action film, THE DEAD might still have satisfied if the leads were even slightly engaging. As written, though, the characters are pretty bland, and the actors portraying them give competent but bland performances. Aside from that, the film is technically solid, and the brothers Ford do manage to deliver a few good scenes of zombie mayhem and a few visually arresting shots. It's not enough to lift the film more than a hair above mediocre, but I do at least appreciate the effort and filmmaking talent that went into this. 2 1/2 stars out of 4. It sounds like I enjoyed The Dead a little more than you did, though I agree with most of your review. The acting was off at times. Still, The Dead beats the majority of modern day zombie flicks. I've had enough of zombie movies already, and we still haven't gotten the film adaptations of WORLD WAR Z and PRIDE AND PREJUDICE AND ZOMBIES in the pipeline. There seems no end. After this year's Academy Awards I had a nightmare about being hunted by zombies. I'm sure a lot of you Millennials think that sounds like great fun, but it just disturbs me. On that note, wonder how many splatterhounds rented John Huston's classy James Joyce adaptation THE DEAD thinking it was about zombies. Serves you right.